The 19th International EISCAT Symposium and the 46th Annual European Meeting on Atmospheric Studies by Optical Methods will be jointly held at the Linnanmaa Campus of the University of Oulu in the city of Oulu, Finland. All registered participants will have full access to both meetings, which will have joint as well as separate (parallel) sessions. We will have the university's most modern lecture space available for the main sessions of the meeting. 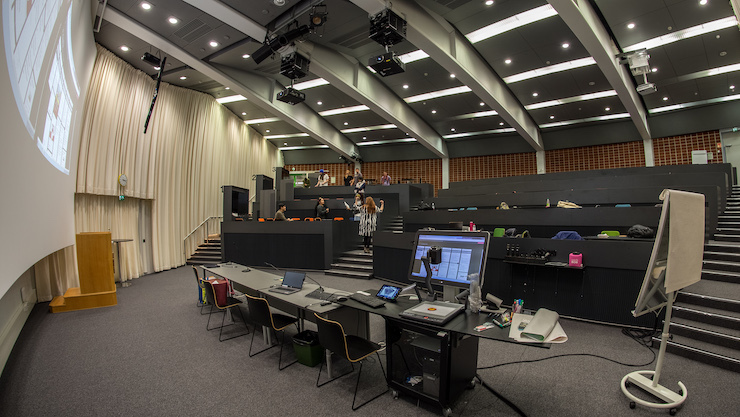 The lecture hall is a terraced space with individual chairs and many tables, so that everyone can reach their seat or leave the room at any time without others needing to get up. Comprehensive multi-screen projectors and displays are available for presenters and session chairs. More information on the location (map) will be available soon. Please make reservations via your usual channels, we do not have a specific meeting hotel. Please make your reservation in good time! Welcome!